If you have ever tried to acquire any of the bottles in this photo from your local fine beverage depot..you know how special this evening was. This was the rarest of events, only 20 tix available to the public. It was part seminar, part dinner party and a celebration of all things barrel aged beer by the the crew who perfected the art and created the category, the good folks from the mighty Goose Island Brewery. This was one of my favorite events and a great way to end the year. There was even a 14yr Heaven Hill Barrel in store used to make this year’s BCS for us to examine. 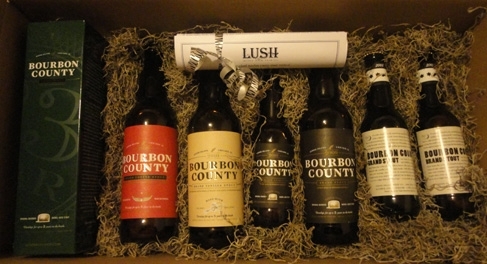 (really cool..it had sawdust & bourbon county stout still in the bottom) Lush is a place where the worlds of hipster chicks and beer geeks collide. These ladies made it memorable by being fun, knowledgeable and serving tasty small plates to compliment the epic brews. Everything from bacon wrapped dates filled w/gouda to popcorn cooked in duck fat. I think we counted 6 dishes total, all odd, playful and delicious. Above all this was a celebration of the art barrel aging, although John mentioned they wont be using the Pappy Van Winkle Barrels for BCS ever again.. he did hint at the idea that they could be used for a version the festival-only barleywine offering King Henry. These barrels leave a nice variety of notes in the finished product, everything from oak, bourbon, vanilla, toffee, chocolate, dried fruit was present. It was amazing to see these flavors come through in completely different profiles from year to year in the vertical tasting. Goose Island, Lush Wine & Spirits, West Town. Bookmark.